I too have lived in America and understand American lingo. Bums are those who idle all day and expect to eat and drink after a day of no work. Be careful vilifying hard working politicians like UhuRuto. These are people who worked and succeeded against all odds to lead Kenya probably for the next 20 years. I am not for Raila but I certainly won’t call him a bum. He worked hard for 20 years to ascend to the presidency but majority rejected his leadership. He may not have a succeeded because of his policies but he’s not a bum. You be careful trying to interpret American lingo because others have been where you’ve been. Yawn yawn.. . Nothng happens my dear brother Sam. And if it tries to want to happen, the culprits shall remove the sovereignity card.. . And from the recent history, u can’t beat the soveregnty card in Kenyan politcal context. 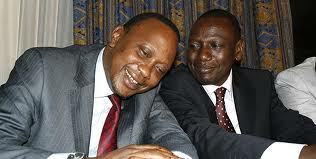 Factually speaking, Uhuruto is a scary couple. They won against Carson etc, they’ve mobilized AU agnst Hague and now the Hague bench is voting on the upcoming Courthouse venue! And hasnt Obama recently dropped the planned Tz visit with most flimsy of reasons? Truth b told brother Omwenga, these boys are Politically poisonous. Swallow them and u get sick or die as u throw them up. Or where’s Kalonzo Musyoka & co today or in the coming future? Haven’t we seen the Britsh parlianment order its gvt to cooperate? Why ddnt any of such happenings occur in the case of Bashir ha? These boys are bad-oh. Even saint Mutunga couldnt hold a candle. They represent some great forces that only brain and not brawn can counter. In short, Hague is irrelevant at ths point. The Court got to play it safe or Kenya whips out world Politcs. And u know who shall b the 1st to jump fence/camp? The West! These guys are never radical. They thnk with their Egos (power) stomachs, dicks, pussies and buttocks (civil n social Liberties). .. If the Hague’s humanitarian purposes aint song to either of the above ends, repeat after me; Hague Ha’i’wes’make.